The newest Version of Photo Studio is released for 3dsmax2016. This Version works only with the new physical camera at 3dsmax2016. 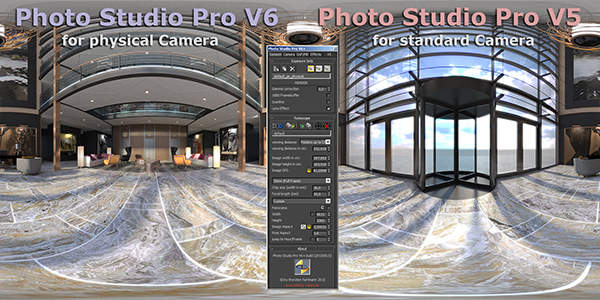 For Standard Camera use Photo Studio V5. - highlight, shadow, midtone saturation don´t work. Submitted by hot chip on Tue, 2012-07-10 04:31.
you are the first with that problems. You are shure you have install the right Version? Submitted by cyrille on Sat, 2012-03-24 17:58. Big bravo for script like render optimizer et shaderutility that i am testing . But i have a big bug with photo studio. After installation i lost all materials and textures in the materials browser. They appear only when i move the window, but i can't list them, expand or retract the list. i don't know how to get them back, even if i delete the two *.ms and switch between driver OpenGL and directX. I can't create material now, it's really a big problem ! Submitted by hot chip on Sun, 2011-01-02 01:59. 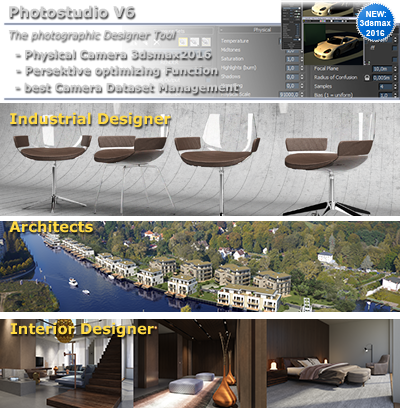 Photo Studio 4+ is released and have now include: Iray Rendering, Panorama Rendering and some Bug fixed.